Istanbul is huge, overcrowded, traffic jammed, hectic and as such it is quite likely to be rather confusing for a first time visitor. However, rest assured: Although Istanbul has over 15 million inhabitants, stretches itself over two continents that are separated by nothing less than a sea, it is nevertheless easy to understand the layout since the water that divides Istanbul also gives very good geographical reference points that greatly facilitate discovering the city. A post on getting around in Istanbul with public transportation can be found on our food blog here. 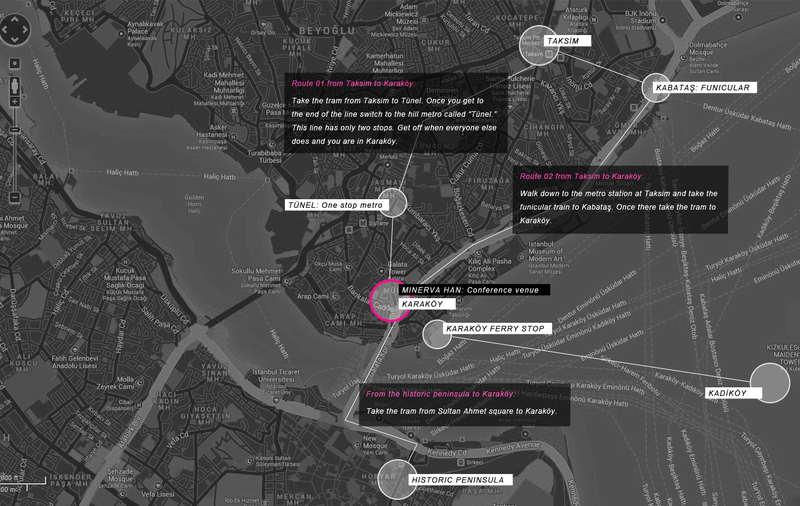 The map above will show you several routes that will get you to the conference venue from Taksim or from the historic peninsula - which are the two locations where you will be most likely to stay. 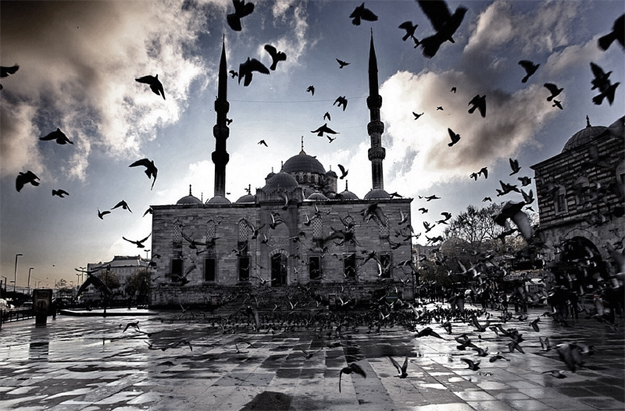 If you wish to find out more about the city you can also read an extended article on some of Istanbul's many centers here. The main thing to be aware of when trying to "get" Istanbul is that the city does not have one city center, but a lot of them. This comes from the fact that historically Istanbul developed out of many villages which then merged into one big city, without however relinquishing their individual identities. 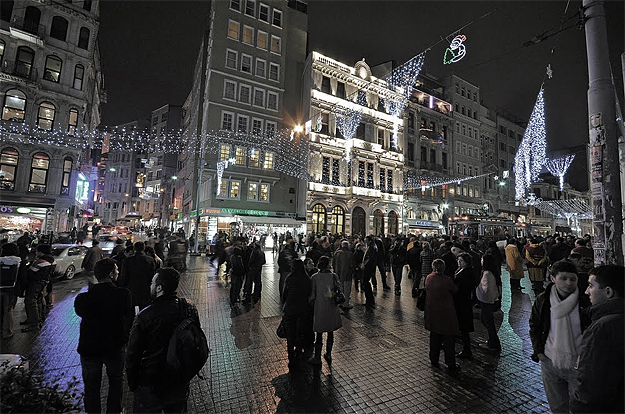 The ArtsIT 2014 conference will be held in Karaköy, which is one such center. 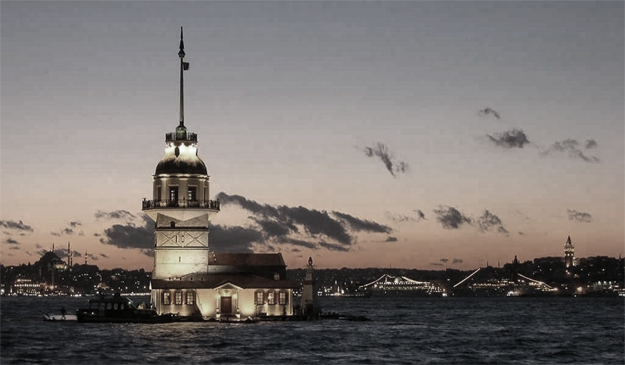 Karaköy is located on the European side of the city, at the point where the Golden Horn meets the Bosphorus. The huge water way that separates the two sides is called the Bosphorus, a very beautiful, winding strait that joins the Marmara sea with the Black sea. The European side is further bisected by an inlet called the Golden Horn (Haliç, in Turkish). The "New Mosque" dates from the 17th. century and is located at the entrance of the historic peninsula. 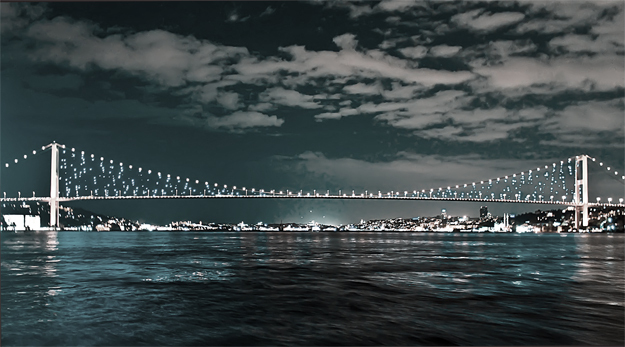 You can get there easily from the conference location by simply crossing the Galata Bridge. On the southern side of the Golden Horn is the famed historic peninsula. This will probably be one of your prime destinations in Istanbul and you can get there very easily from the conference venue by taking a tram across the Galata Bridge and up to Sultan Ahmet Square, where The Hagia Sophia, the Blue Mosque, the Byzantine cistern and the Topkapi Palace are to be found in close proximity to one another. 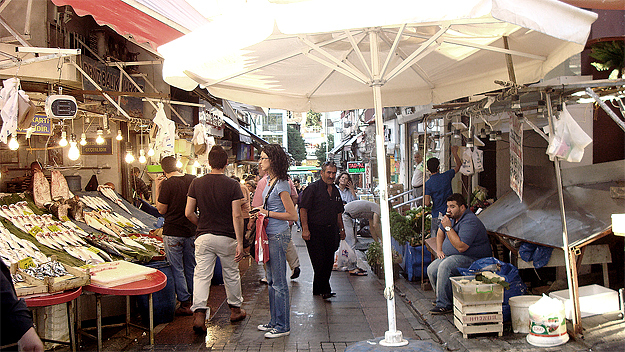 A west-ward walk from Sultan Ahmet Square will also take you the Grand Bazaar. And the famous Spice Market is down by the Golden Horn, adjacent to the New Mosque, an image of which is shown above. Going north from the Golden Horn however, the city center stretches for many tens of miles, comprising numerous commercial as well as entrainment oriented centers, that are lined up along the Bosphorus and also continue inland over the many hills of Istanbul. 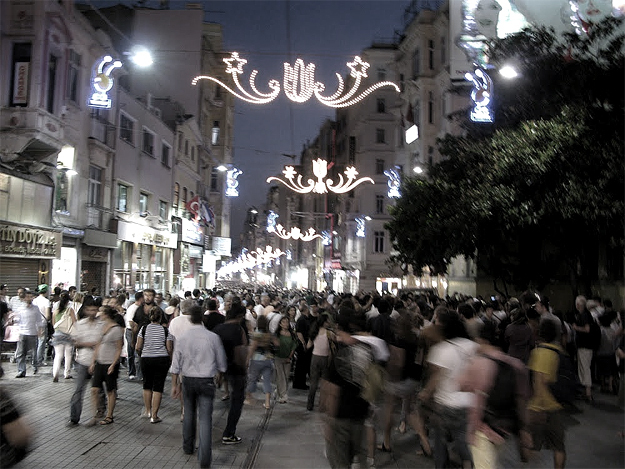 Taksim is a huge square, from where a mile long pedestrian street called Istiklal Caddesi originates. To the left and to the right of this long avenue are to be found literally hundreds upon hundreds of eating, drinking and entertainment venues. The overall area of Taksim is probably best divided into 3 sub-areas: Taksim proper, Galatasaray and Tünel. There are lengthy posts for all three on our food blog, here, here and here. However, Taksim is by no means the only fun part of town. In terms of the ones that are easily accessible from the conference venue, we would also like to recommend a trip across the sea with one of the commuter ferries that leave from Karaköy to Kadiköy - a lively market neighborhood with many restaurants and taverns that is to be found at the other side of the sea. You can find out more about what Kadiköy has to offer on a collection of posts on our food blog here. Ortaköy (above) and Beylerbeyi (below) are two of the many Bosphorus villages that you can visit for a nice meal. More information on them and on how to get there can be found here and here. Another very pleasant thing to do in Istanbul is to explore the Bosphorus by taking a pleasure boat that will take you up the straits. These boats leave from Kabataş, Üsküdar (Asian side) and Beşiktaş. Or you can visit some of the many "villages" that line both sides of the shore, such as Ortaköy and Beylerbeyi, shown in the images above. Coming back to Karaköy, where the conference will be held,you will be in close proximity to the young art scene of Istanbul since Karaköy and nearby Tophane house many indy art galleries, creative collectives, young designer enterprises, together with cafes and bars. Just up the hill, easily reached with the "Tünel" metro is the Galata tower and its delightful neighborhood of shops and cafes, and a walk away from Tophane is Çukurcuma, yet another neighborhood of antique stores, art galleries and small boutiques and cafes. Things to do and places to see in Istanbul are too many to cover on this page. More information on the city and its many centers, particularly as regards food and entertainment, can be found on the food.istanbul site which we created for the ISEA2011 conference.